The family-run Hotel Arlette Beim Hauptbahnhof is only 200 metres away from the Zurich Main Station and a 3-minute walk from the heart of the city. It has a 24-hour reception and offers free WiFi. All rooms are air-conditioned, non-smoking and feature original works of art by Ana Luisa Benítez from Gran Canaria. 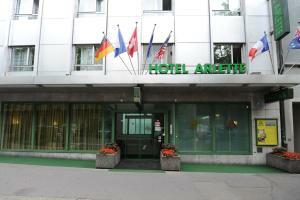 Hotel Arlette Beim Hauptbahnhof serves a breakfast each morning from 06:00. The University, the ETH Zurich and the University Hospital are also just a 5-minute walk away. Guests can reach Zurich Airport within a 10-minute train ride.